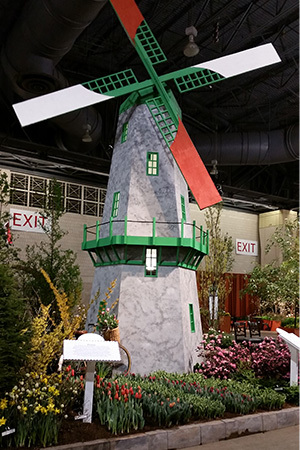 The Mercer windmill rose over the display and the huge convention center exhibit space. The group's hard work paid off with two prestigious awards. The massive loading and construction process began five days prior to the start of the show. From left are student Renine Jackson, adjunct faculty member David DeFrange, student Pam Mills, instructor Ron Rabideau, and Professor Amy Ricco. 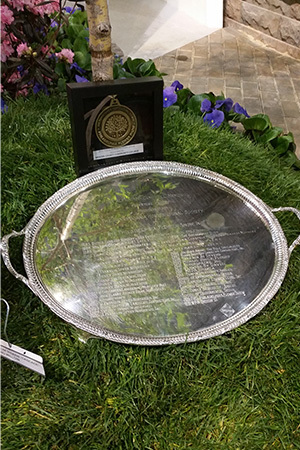 West Windsor, N.J. – Hundreds of hours of work by students and faculty from the Mercer County Community College (MCCC) Horticulture Program, plus the assistance of graphic design and art students, all added up to a Gold Medal in the Education division at the prestigious Philadelphia Flower Show that concluded March 19. Mercer's "Postcards from Holland" display also earned the Alfred M. Campbell Memorial Trophy, a major award for an educational exhibit that demonstrates the most successful use of a variety of plants in a unique fashion. Following an arduous week of moving and constructing the massive display at the Philadelphia Convention Center, MCCC students and staff took turns volunteering at the exhibit and answering visitors’ questions during the eight-day show. This year marks the fourth consecutive year that MCCC has participated in the show, the only community college to be represented. Notes MCCC Professor Amy Ricco, Coordinator of the Ornamental Horticulture and Plant Science programs, MCCC’s interactive “Postcards from Holland” brought the show’s Holland theme to life in all its beautiful glory. Visitors were able to tour the farm, brimming with rows of corn, tomatoes, and tulips, and populated by two calves and a sheep – wireframe topiaries stuffed with sphagnum moss, covered with Cryptomeria, and spray painted. 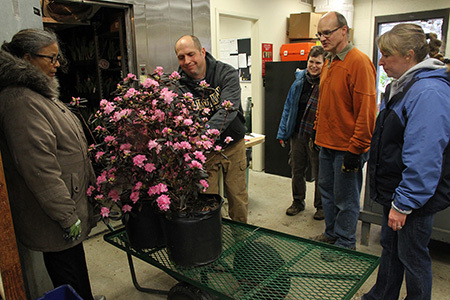 Featured in the park section were rhododendron, witch hazel, roses, and several large trees – all of which were forced into bloom in Mercer's greenhouse. The windmill was built in two pieces that were put together at the Convention Center. The display also had a water feature and two vintage bicycles decorated in flowers. The educational elements were contributed by MCCC Fine Arts, Graphic Design and Illustration students, who created posters on Holland’s agriculture, flowers, its abundance of parks, and its use of windmills, as well as a series of eight different postcards with facts about Holland for large-scale distribution. A Television student produced a two-minute video on sustainability in Holland that looped continuously in the windmill and barn.